The ubiquitous nature of the internet has meant some corners of the relatively-new technology are unsafe for children, which is one of the messages being shared on Day For Daniel. The event is Australia’s largest child safety awareness and education day, this year held on Friday, October 26. 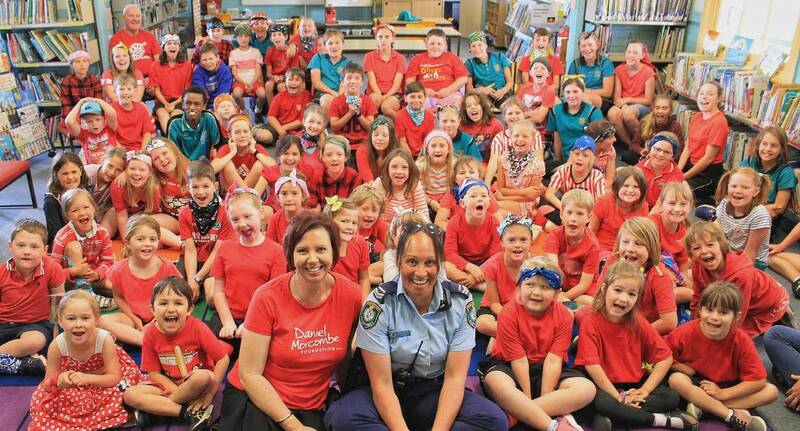 Senior Constable Donna-Marie Clarke of the Batemans Bay Police said social media was a large problem, as use of it could result in withdrawal from the family unit and community, or bullying. “Parents allow kids to talk to whoever they want to, it’s not being monitored at all really,” she said. “The online world is where parents are finding a lot of their problems as their kids get older, I can confidently say from age 11 up. What she wanted to drive home to parents was to look at their children’s behaviour when assessing if they were experiencing problems online. “Rather than talk, watch them and listen. If what you’re seeing is not normal to what they have been doing, look at what they’re doing online,” she said. Senior Constable Clarke said issues that stemmed from the online world such as bullying affected youths in metro and regional areas equally, and rates were not decreasing. “It has not been reported enough to police, for various reasons families don’t want to tell police their problems, they try to deal with the issues themselves,” she said. Day For Daniel ambassador Melissa Pouliot said another factor to think about was how parents’ social media usage influenced their children. Senior Constable Donna-Marie Clarke and Day For Daniel ambassador Melissa Pouliot talk about ways to stay safe with Wolumla School’s Clancey Whyman, Renato Barrios-Jacobs, Amelia Walsh, Zak Rayner and Kaleila Mazzei. On Friday, Senior Constable Clarke visited Wolumla Public School to talk to pupils at the school about ways to keep themselves safe. They discussed when in trouble who were safe people to go to, such as neighbours, police and teachers, as well as safe places to go to, such as home, school, police stations and hospitals. Senior Constable Clarke said if the children were lost and a person they did not know asked them to get in their car, the children should scream “no” as loud as they could so people in the neighborhood could hear them, then they should run away. “People tend to take more notice if people yell loudly rather than if they yell ‘help’, unfortunately,” she said. If that ever happened, she said children should try to remember as many details about the person and the car they were driving as possible, such as the car’s colour. Also, children should memorise their full name and home address so they could tell the police when they called Triple Zero (000), as well as the address of the location where they were calling. Words have real power. Words can wound, words can heal. And in my case, words can find people. In 2013 I put a whole bunch of words together in a crime fiction novel I named Write About Me. After I finished all my made up words I wrote some real words about my cousin, Ursula Dianne Barwick, who went missing in October 1987 when she was 17 and I was 15. Those words, among many others, spurred me on to keep writing, and to keep searching for the truth about Ursula. Four years and four more books later, around half a million words, and I am staggered by how much words have changed the course of my life. 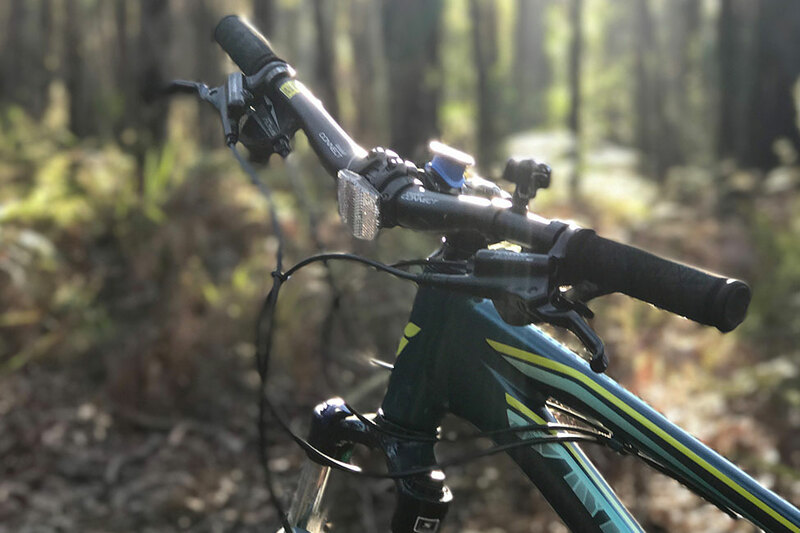 Finding Ursula was a team effort, driven by two dedicated detectives from Kings Cross – Detective Sergeant Kurt Hayward and Detective Senior Constable Amy Scott. I had a small but strong support network every step of the way, encouraging me to be brave in my pursuit of the truth. Initially thinking it was too late to solve the mystery of her disappearance, my quest started as a way to honour her memory. To show her, no matter where she was, that I had not forgotten about her, I had not stopped missing her, I had not stopped searching for her. An amazing groundswell of support followed, and it soon became clear that Ursula wanted to be found. On July 19, 2017 I tried to say goodbye to Ursula, who, nearly thirty years after she went missing, is FOUND. Her lifetime was 17 years, two months and thirteen days. I stood with my family, some of Ursula’s school friends, the people who worked so hard over the past several years to find her and the people who have supported me along the way. Ursula’s Mum, my Aunty Cheree, wasn’t with us, although I like to think she and Ursula were reunited when Cheree died in 2004. To be completely honest, I am at sea as to how to say my final goodbye, as the long journey of her death is not over yet. We are still trying to join the dots that connect Ursula and the fictional character of Jessica, who she created for her new friends in Sydney that were with her when she died on the Hume Highway at Tarcutta on October 27, 1987. I am unable to gather the words to describe my grief at discovering that Ursula died in a car accident only a short time after she went missing. During that first horrible, painful, devastating year after she went missing, words refused to settle into neat sentences. Then they raced around in circles for the 29 years that followed, all those years when we held onto hope she would come home to us. But she couldn’t. Because she was long gone. I haven’t fallen into a crumpled heap onto the floor to sob my broken heart out. My stomach doesn’t twist in pain. I still wake up each day with fresh hope for a new day, and my life is moving forward at its usual rapid pace. Instead of the raw volcano of emotion that I expected to go with the news that Ursula is dead, I carry around a dull ache across my shoulders, behind my eyes, in my right leg and in my lower back. My grief moves and shifts around, quietly, reminding me every now and then that she is really gone. There are other signs of my grief. I forget things. I fade away in the middle of an important conversation. I lose concentration while riding down a steep, rocky hill and nearly end up in a pile of trauma at the bottom. Every person who knew Ursula, both those who grew up with her, those who were close to her, and those who only said a casual hello to her in the school yard or up the street, all remember the same things. Ursula was always laughing, always smiling, always having fun. The circumstances surrounding her death are now in the hands of the NSW Coroner and I look forward to having clearer answers to the questions we cannot answer at this time. Maybe then I will be ready to say my goodbye. Her legacy, the thing that will inspire others for many years to come, is that it is never too late to find your missing person. Yes, words certainly do have power. They can wound, yet they can heal. And as I have shown, words can find people. This was my speech at the official launch of FOUND, my fifth crime novel. 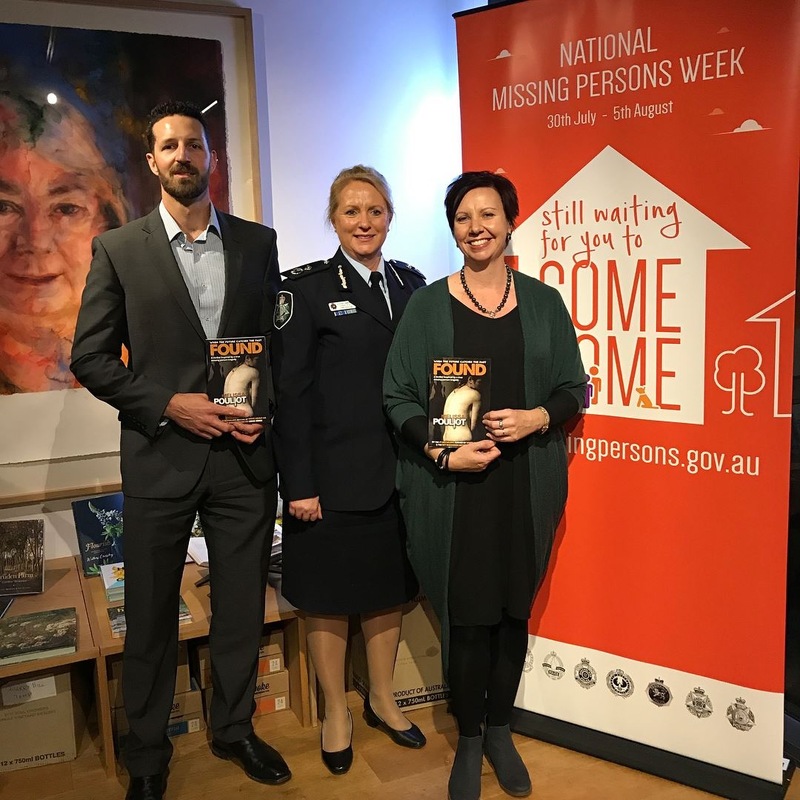 The Australian Federal Police Assistant Commissioner Debbie Platz launched my novel at Canberra Muse on July 27, 2017 as part of National Missing Persons Week. 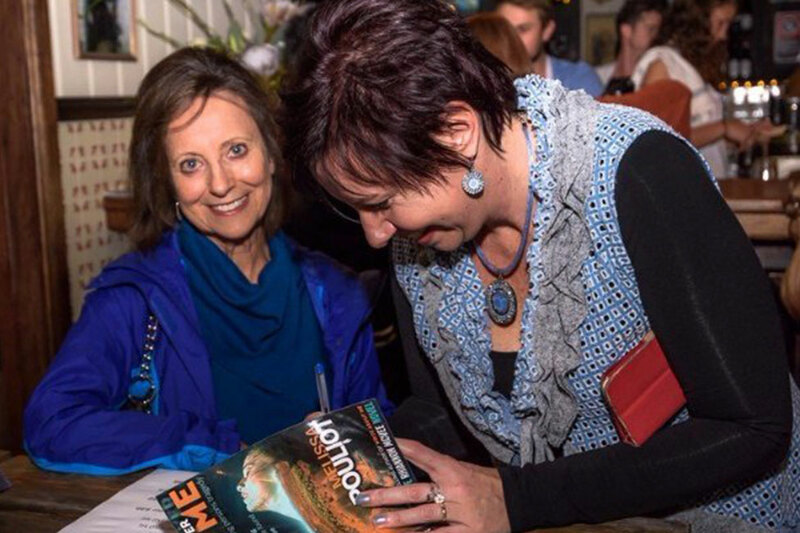 My closest family, friends, parents of missing people and keen readers wrapped me in love as I spoke publicly for the first time about Ursula being found. The role of faith, personal stories and imagination play as starting points in writing puzzles, mysteries and journeys. 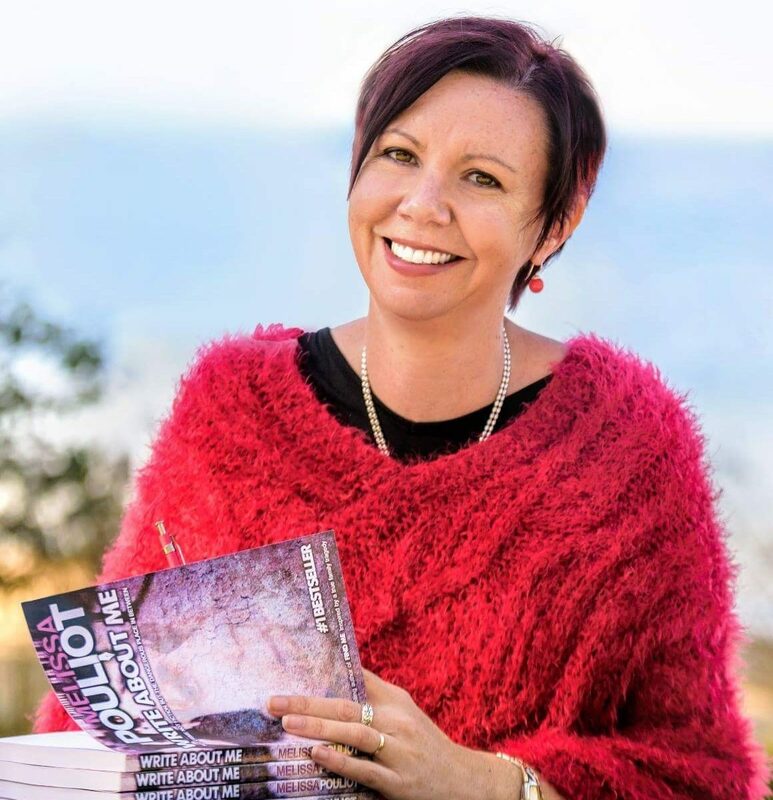 This was the topic that started a fascinating discussion involving myself and fellow self-published author Karen Nelson during the inaugural About the Book festival in Merimbula. Experienced facilitator and regional news storyteller Ian Campbell and people in the audience asked lots of great questions. Although Karen and I write very different novels, we are similar in our passion for telling important stories through fiction. I never miss an opportunity to speak publicly about my love for writing and how I shift between writing fact by day as a media company owner , and fiction by night, as a crime fiction author . I also never missing an opportunity to talk about missing persons , how more than 38,000 people go missing in Australia every year, which is more than 100 a day. 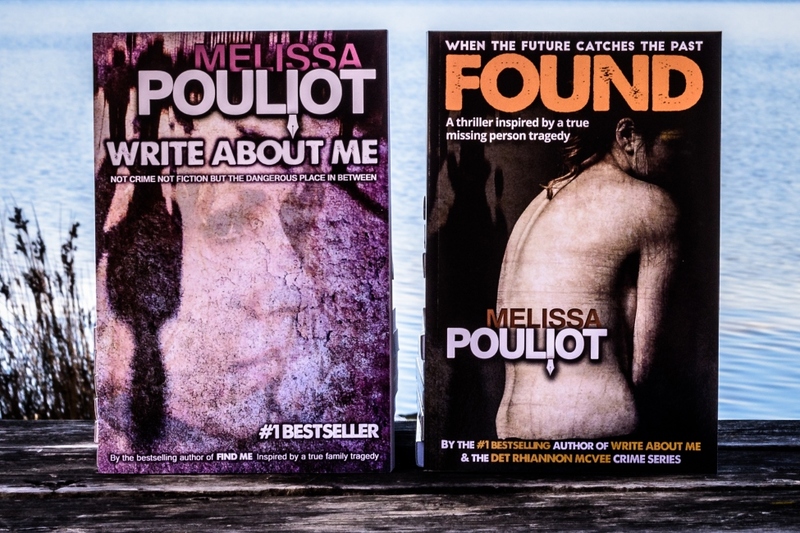 How my books are another way of trying to connect with the broader community to take notice and help foster more understanding and support for missing people, their families and their friends. I’m always happy to share my tips on self-publishing and how I navigate through the quickly changing book publishing arena. I even managed to get on the microphone during a self-publishing session during the festival, and shared some of my experience and insights in how to get your book ready for publishing. About the Book is a festival celebrating all aspects of the book. It embraces all books, old and new, in whatever form they take. They embrace any style and form of the book: graphic, comic, picture, text, fold out, grimoires or whatever manifestation the book happens to take, in both traditional and new media, embracing and celebrating what has happened in the past, while anticipating the future. I look forward to seeing this event grow and become a permanent fixture on the Australian book festival tour – watch this space! To find out more visit About the Book’s website HERE . When you don’t think you are going to meet that major deadline, and you are drowning in the sheer size of the task, you need to remind yourself that you can do anything! But sometimes you need an unshiftable deadline to make it happen! I managed to finish my fifth crime fiction novel (80,000 words) and submit it to a publishing award six hours before deadline, and I feel proud. I wrote this novel in my spare time, around family and my business commitments, and I had to be super organised, passionate and motivated. But I needed a deadline, not one set by me as that is easy to shift, but one that wouldn’t change. I actually ‘finished’this book on January 1, 2017, which was the first deadline I had set for myself. However, it wasn’t actually finished, it was in very rough draft. I then faced what seemed an insurmountable task to proofread, edit and organise the book into something that closely resembled a real book. 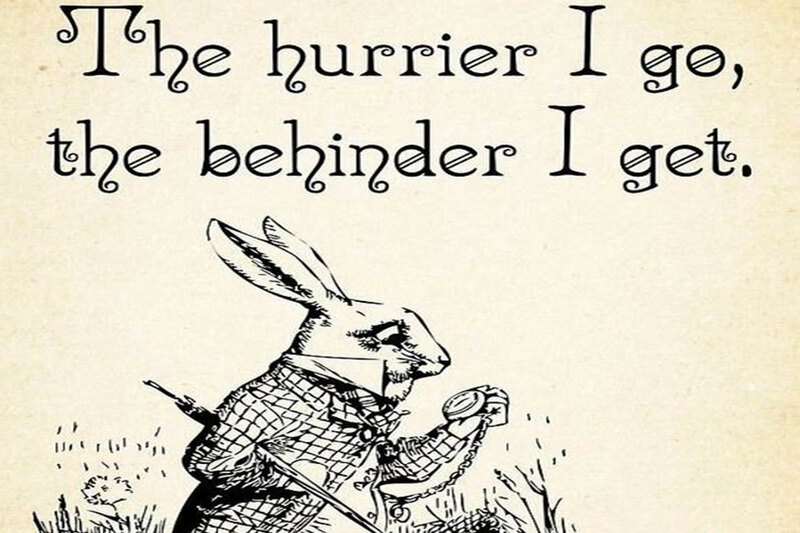 I stuck at it quite diligently for a while, but then life got in the way, and my scribbled on manuscript sat in a messy pile on my desk reminding me every day it wasn’t done. Twenty-four hours before the deadline I really didn’t think I was going to be able to do it, but I meet deadlines every day for my clients, so was determined to meet this deadline for myself. If you’re a writer and struggling to finish your manuscript, remind yourself to breathe, write lists, remember to do what you love, then go for it! Because you can do anything. 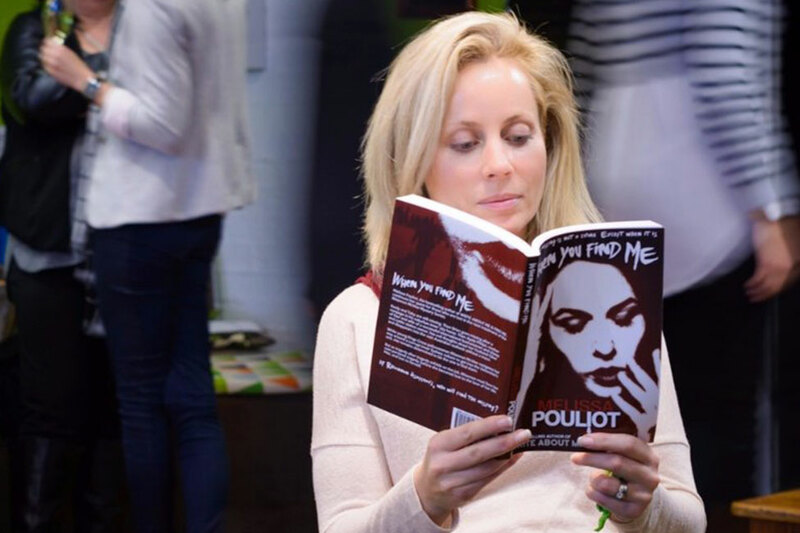 TO THE thump of leather on willow, crime writer Melissa Pouliot delves into the heartache of families with missing loved ones. As her children play Saturday morning cricket, Melissa imagines life in Kings Cross in the 1980s and the unremitting grief felt by families of missing people. Melissa doesn’t have to delve far to find empathy — her teenage cousin went missing in 1987 when Melissa was just 14 and her disappearance was never solved. It’s this Saturday morning routine that has allowed her to become “a book writing machine” as her children, Jake, 17, Tom, 12, and Laura, 7, describe her. She has published four novels about missing people, Write About Me (2013), Find Me (2014), When You Find Me (2015) and You’ll Never Find Me (2016). The former journalist, originally from Quirindi in NSW, now lives near Merimbula on the NSW south coast. She has never given up hope there will be answers to her cousin Ursula’s disappearance. Melissa is hopeful her cousin’s disappearance might be solved by the 30th anniversary of the date she went missing, but she is aware of the limitations of the original police report. Melissa’s first book, Write About Me, is fiction but was inspired by Ursula, and Melissa drew on her family’s experience. She admits it was somewhat cathartic. At the last minute before publication, Melissa decided to include an end note about Ursula. The publication of the book led to fresh leads and Melissa was determined to get the inaccurate records changed. “Ursula’s case was never closed and in the past few years it was given to a new detective and it has been a whirlwind since,” she says. As a journalist, Melissa says she had always wanted to write, but never thought fiction would be her style. 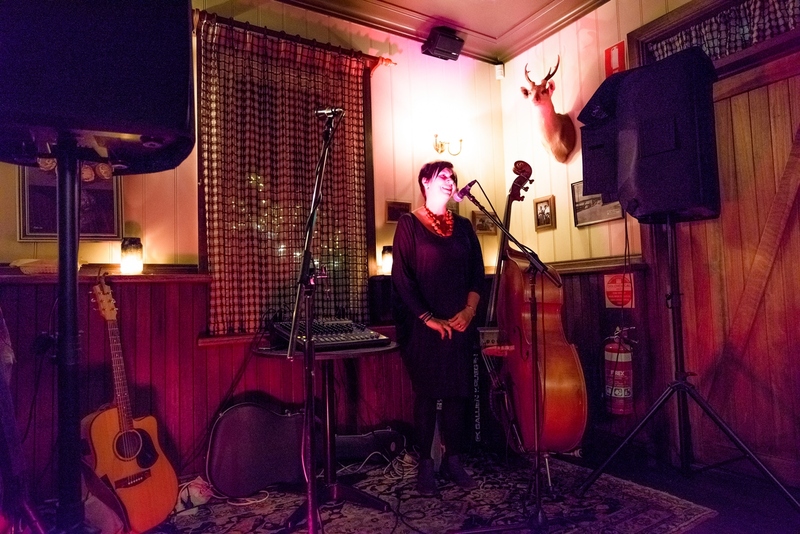 Melissa started her career at a newspaper in Charleville, Queensland, before a long stint in the Wimmera where she worked in journalism before launching her own public relations company. She started to write about Ursula, her missing cousin, but there was too little information about the disappearance of the 17-year-old to hold up a book, so Write About Me became a blend of fiction inspired by real-life events. As a journalist who sticks to the facts, Melissa says she found writing fiction liberating, although she brought some journalism skills to the research. “I have police officers who worked in the 1980s who check my police sections and my brother lived in Potts Point since the late 1990s so he helps me find the Kings Cross history,” she says. Melissa says her family still grieves for Ursula, as many families of missing people do. Check out the Book Clubs page on this site for Reading Group Questions for all my books! When I was in my late twenties a friend and I started a book club in the tiny rural Victoria town of Minyip, home of the television series The Flying Doctors and home of some very special people in my life. Nikki and I wanted to discover books that were not on bestseller lists, to challenge ourselves by reading books we would never consider purchasing in a bookshop, and to find books that didn’t follow a formula. Okay, we also wanted an excuse to get together and drink wine! I have since moved away and our book club is no longer running, but many of us still keep in touch and remember the wonderful books we read and the robust discussions each book inspired. Although I had always wanted to be an author, I never imagined that one day book clubs just like mine would be reading and discussing my books. It took a lot of courage for me to firstly write, then release to the world, my debut fiction novel Write About Me – inspired by the mystery surrounding the disappearance of my cousin Ursula in 1987. More than one hundred thousand people have read Write About Me since it’s 2013 release, and it has been the impetus for a fresh investigation into Ursula’s case. I’m so proud of this book, and of what it stands for. It has changed my life and the life of so many others. On my never ending list of things to do when I became a published author was to put together a list of reader discussion questions for all my books, of which there are now four with a fifth underway. With the help of my book club friend Nikki, here is a list for Write About Me . Kicking things off is what Nikki thought of my book. The year is 1988 and 16-year old Annabelle Brown from northern Queensland runs away from her family and friends for the bright lights of somewhere new. She ends up in Kings Cross in Sydney where her life takes some dark twists and turns. Endorsed by the Australian Federal Police, Write About Me is real and raw and will break your heart into a million pieces. Inspired by the author’s true family cold case mystery, Write About Me is a heart-wrenching story about a teenage runaway who doesn’t come home. Not crime, not fiction, but that dangerous place in between. 80’s song references – Does this help to take the reader to the time and place in the book and invoke emotions/nostalgia? Are the lyrics of each song relevant to what is going on in each chapter? Q: Is the book fact or fiction? A: This is a great question and I get asked all the time. Q: One of your characters is a young policewoman named Rhiannon McVee. Who is Rhiannon McVee? A: A twenty-something girl from the Australian outback with her eyes set firmly on being a detective. Her career starts in the late 80s at Kings Cross Police Station, amongst a dominant male police force who see so many people go missing that one missing person just blends in with the next. But Rhiannon’s no pushover, and doesn’t take no for an answer when she’s on a case. Off the job Rhiannon is like any normal girl in her twenties, she loves to party, she loves her family and she loves her cowboy who waits patiently for her to return to her outback home. Rhiannon McVee is also the detective I have created as my own fairy godmother, who I wish was in our lives in 1987. It’s people like Detective Rhiannon McVee who make our lives better and help us find our missing loved ones. And when we do, she’s there to help us pick up the pieces. Q: How difficult is it to fictionalise what you have experienced in real life? A: Fictionalising a real life experience the way I have, gives me some distance and allows me to explore the experiences of others. All my characters have something important to say about missing persons. For example, one of my favourite characters is Rhiannon McVee. I’m so captivated by her I’ve created a detective crime mystery series in her honour. Through her experiences and those of the people she’s looking for, I’m able to convey the issues and feelings that surround missing people. Rather than get dragged down by my own experiences missing Ursula, writing fiction helps me channel my energy into a reinvigorated search for answers. Through my books I am giving a voice to Ursula, and to all of those who are missing. Q: Your books are drawn to two distinct places – Kings Cross and the Australian outback. Can you explain the significance of location for a writer? A: Location is extremely important when you are piecing your story together. While I write I see the scenes play out in my mind like a movie, and location plays such an important part. Both Kings Cross and the Australian outback have a real sense of mystery about them. They’re intriguing and although vastly different, evoke similar feelings for the reader. The outback is such an isolated and lonely place, and with that comes a sense of foreboding and danger. Kings Cross is so small size-wise compared to the outback and it’s busy and hectic and noisy, but has the same sense of foreboding and danger. I love moving from one space to the next in my books, as both provide dramatic backgrounds for my characters.